.75 cent Wings All Day. Happy Hour 11-7pm. Appetizers 1/2 off 3-7pm. $15 All you can eat Fish & Chips. Happy Hour 11-7pm. Appetizers 1/2 off 3-7pm. All you can eat Lobster $40, available while supplies last. Happy Hour 11-7pm. Appetizers 1/2 off 3-7pm. $15 BBQ Rib Dinner. Happy Hour 11-7pm. Appetizers 1/2 off 3-7pm. $20 Smoked Prime Rib Dinner. Happy Hour 11-7pm. Appetizers 1/2 off 3-7pm. $50 All You Can Eat King Crab Legs. Happy Hour 11-7pm. Appetizers 1/2 off 3-7pm. $5 Pulled Pork Sandwiches All Day. Happy Hour 11-7pm. Appetizers 1/2 off 3-7pm. Once you dock your boat on our floating dock marina, come on over and enjoy the tastiest grill you will have ever ate from. For more information on the Blu Mangrove Grill, be sure to check out there website right here! Wanting to take your own Boat Tour to our own Riviera Dunes Marina? Now you can even before you head over to our Bradenton Marina! Check out this short video from our friend Kent Greene and explore the Manatee River and of course our infamous marina yourself! Looking at spending a few days on the Manatee River? Be sure to stop by Riviera Dunes Marina to check out just what this popular destination has in store for yacht owners of many sizes. Contact Riviera Dunes Marina today for information on renting a slip and to see just what is going on around our beloved Palmetto and Bradenton cities over the next few days. Located right inside Riviera Dunes Marina is the wonderful dining of the Blu Mangrove Grill. As the perfect restaurant for everything that Riviera Dune Marina is, the Blu Mangrove Grill will be hosting multiple bands and events occurring over the next month. Check out right here what you can expect from the live entertainment of our in house restaurant for the month of May. For even more information on Riviera Dunes Marina and our Bradenton marina entertainment, feel free to contact us at 941-981-5330. When looking at visiting our Bradenton Marina, why not take a look around at some of the great sites and sounds of the city as well? Take a look at just what you can experience from Bradenton, FL and see why so many families decide to take their Luxury Yachts to Riviera Dunes Marina for a quick get-away to this beautiful city. What Should I Expect From A Palmetto Marina? When looking to answer this question, it is a little bit more extensive than you may think. Riviera Dunes Marina is known nationally as the premier Palmetto Marina, but when you are looking to rent a slip, utilize our pump out or fill up on ethanol free mid-grade boat fuel, you may want to know exactly what all of this means. We strive to help our renters understand exactly what it is that they are getting from Riviera Dunes Marina, but we may want to go over the verbage first. These are just a few the many terms that you may want to start to learn as you look forward to utilizing Riviera Dunes Marina for your next slip rental. Of course now has never been a better time to stop by the premier Palmetto Marina as the De Soto Seafood Festival is about to start up in less than two weeks. For the first time since the beginning of this cherished festival, we will be seeing the activites and events in Palmetto. Get ready to enjoy food, music and fun for everyone as the De Soto Seafood Festival comes to Palmetto in the beginning of April. If you are looking to enjoy the Seafood Festival from the privacy of our Marina, be sure to contact us as soon as you can as Slip Rentals are going fast for this prized event. You can contact the top rated Palmetto Marina by visiting our website, or by contacting us directly at: 941-981-5330. We hope you all come out to the De Soto Seafood Festival and can not wait to see everyone at the premier Florida Marina very soon! What is a Marina and Where in FL can I find a Palmetto Marina? Riviera Dunes Marina has been a staple in the city of Palmetto for decades. As a luxurious alternative to the normal marina’s that are featured throughout Palmetto, Bradenton and Sarasota, Riviera Dunes Marina adds that little extra elegance that every boating fan desires. But what exactly is a marina and how does it work? A marina is more so than anything a dock or a type of basin that has supplies and items most yachts and small boats may need for safe travels. In difference to a port, our Palmetto Marina does not handle extremely large vessels such as cargo ships or large passenger ships. 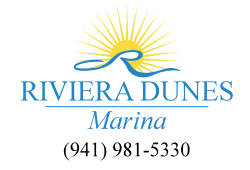 Like most marinas, Riviera Dunes Marina does supply a refueling, docking, washing and repair facility including an on-site pump out. In addition to the marina slip rentals that we have available at all times, parking for cars and other vehicles is also readily available for those that are towing or driving as well. 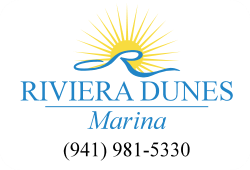 As a premier Palmetto Marina, Riviera Dunes Marina is located at 102 Riviera Dunes Way, Palmetto, FL 34221. In comparison to our neighboring Palmetto Marinas, you can expect luxury accomodations and facilities as well as highly trained and friendly staff members, clean and modern slips and of course a pump out station that many of our boaters desperately desire. With a wide range of available slips anywhere from 30 feet to 120 feet, we have a space that will fit every boaters needs and budget. Be sure to contact the premier Palmetto Marina during your next sail down the Gulf of Mexico and be sure to contact us for our Daily, Weekly, Monthly and Annual Rates and Specials. Our upcoming DeSoto Seafood Festival in Palmetto will surely bring the crowd as everyone gathers around for the high quality entertainment and food that has rocked this festival for the past 20 years. As this is the first time in Palmetto after being in the Bradenton Marina area since the beginning, we are glad to welcome any newcomers to the Palmetto marina to test out just how much they love these slip rentals. For the first time since the De Soto Seafood Festival began, Palmetto, FL will be the recipient of this prized event. Thousands of people are expected to come to the event when Sutton Park hosts everyone’s beloved festival. With an increase in participants, the move to Palmetto was mainly due to the popularity and the desire for a larger venue. The event, being held at Sutton Park on 6th Street West near 10th Avenue, will feature local seafood, barbecue, children’s area and entertainment for everyone in Palmetto to enjoy. For the entertainment at the festival, you can expect local bands, country music star Travis Tritt and ’80s hip-hop artist Vanilla Ice. To enjoy the sights and sounds of the De Soto Seafood Festival, admission for each day is $3 for everyone age 12 and older, and children under the age of 12 get in for free. Approximately 35,000 people are slated to enjoy the upcoming De Soto Seafood Festival, taking place from April 4-6. With this many visitors coming to Palmetto, it is the perfect time to bring your boat to the Premier Bradenton Marina. If you are looking to enjoy this festival to the highest extent, then be sure to stop by Riviera Dunes Marina. We have multiple slip rentals available to suit your needs. Enjoy the festival all day and relax in the premier Bradenon Marina just 1.5 miles away. Avoid the hassle of the event from Riviera Dunes Marina as water taxi transportation will be available all weekend long to the De Soto Seafood Festival. Contact Riviera Dunes Marina today and reserve your slip before the event begins.